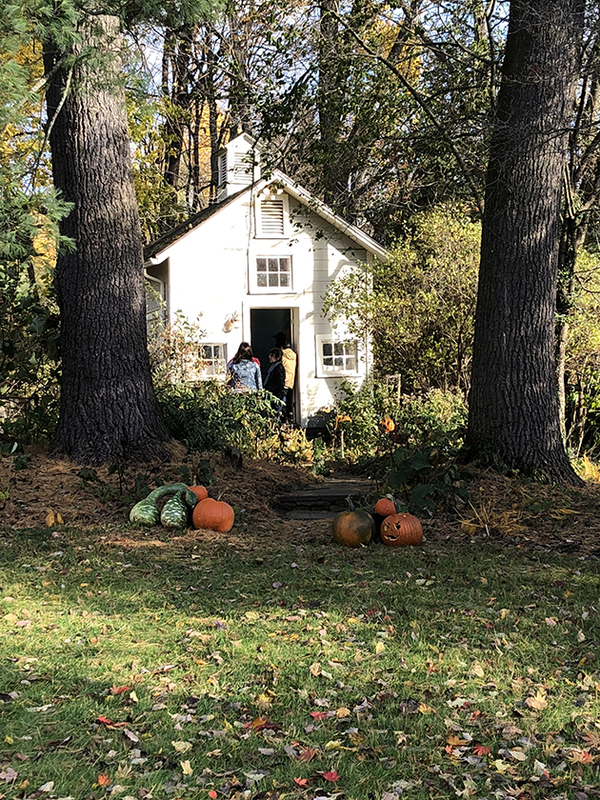 Contributed by Sharon Butler / KK Kozik’s novel ICEHOUSE Project Space, located on the quaint town green in Sharon, Connecticut, is an old 10 x 15-foot wooden shed that was once used to store ice from nearby Mudge Pond. 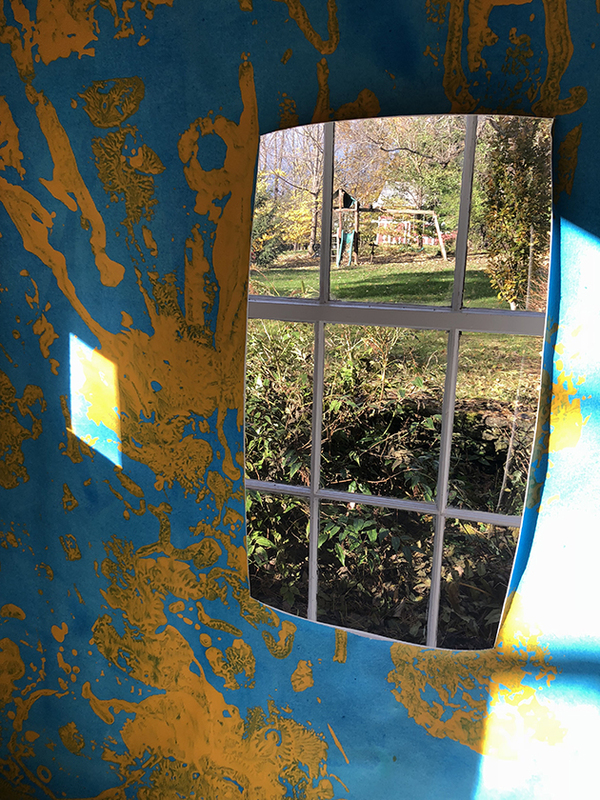 Stephen Maine hung his first site-specific painting there this past November. However rustic, the effort was auspiciously resonant: his painted canvas was wrapped around the interior walls of the shed, completely covering them. Like much of Maine’s work, the painting conjured the all-over pattern of printed fabrics, but as usual he rendered it using a process that involves a handmade contraption that mimics commercial screen-printing techniques without focusing on perfect registration or exactitude. Geoffrey Young selecting a section of the painting. 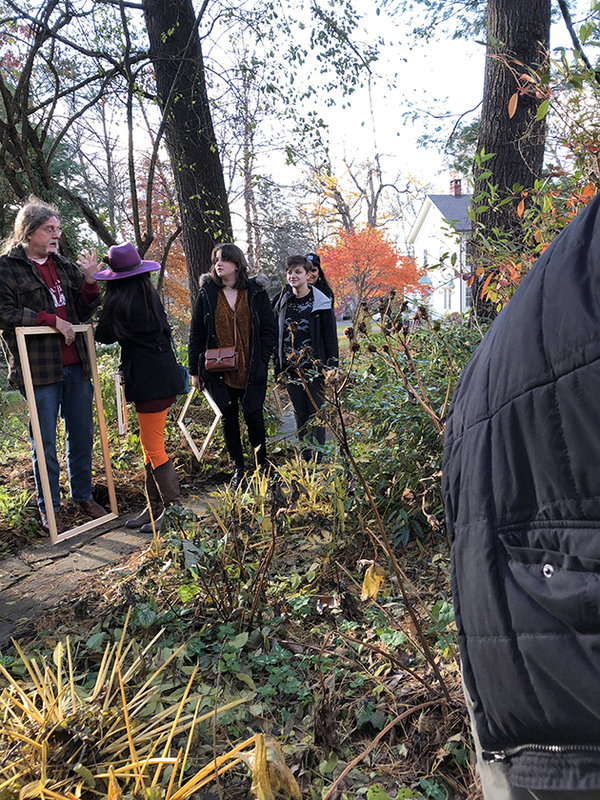 I stopped by the closing party, where Maine had invited art colleagues, fellow artists, and friends to bring stretcher bars and select sections of the 10 x 45-foot painting that he would cut out, stretch, and let them take home, gratis. I was in the neighborhood having lunch at the nearby White Hart Inn in Salisbury that day, and I didn’t have stretcher bars, but Maine let me choose a piece anyway. I got the lower left corner of the south wall, which he signed and numbered on the back—just in case the pieces are ever brought together in another installation. Artist Joe Clarke stretched the paintings for everyone. 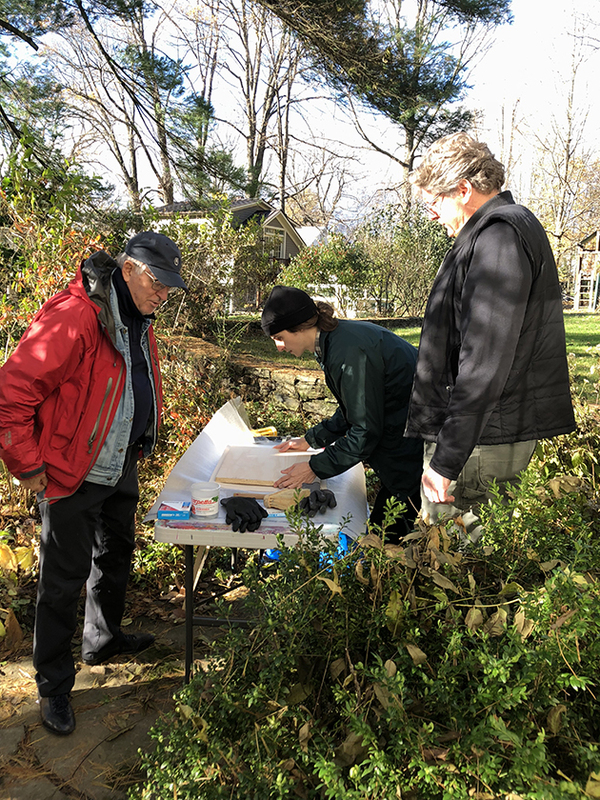 Here Stephen Maine, at right, helps decide on the cropping and signs the canvas. Visitors stand in line with their stretchers, waiting to take a turn picking their paintings. Stephen Maine, Fire and Ice installation, looking out the window of the space. 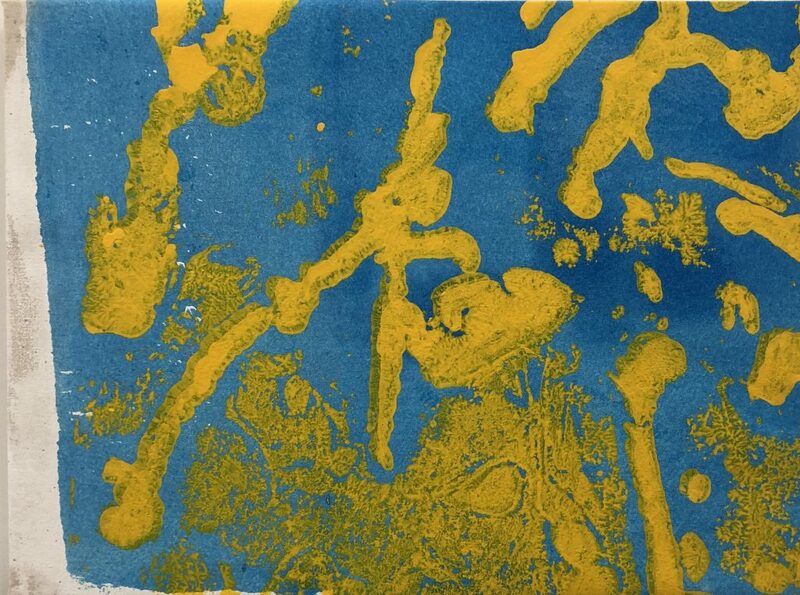 Called Fire and Ice, Maine’s painting featured a cool, thinly-painted blue background overlaid with bright yellow splotches and organic shapes. Maine wrote in his notes about the show that he “calibrated these two hues to the existing light conditions for maximum optical vibration,” but they also seemed to reference the aquatic plant life and the watery surface of the pond itself. I brought the painting scrap to my Brooklyn studio, where the canvas sat for several weeks. When I finally stretched it, I recalled the history of Mudge Pond and others like it, where, in the 19th century, before houses had electricity let alone refrigerators and freezers, many New Englanders engaged in a lucrative, if labor-intensive, ice trade. They cut ice from the pond into slabs and shipped them all over the world. Now, as I look at my evocative, newly-stretched 18 x 24-inch painting, the size, shape, and color remind me of a block of ice. So, more profoundly, does Maine’s post-composition process. Like the icemen in the 1800s, this cleverly expansive artist has sliced up an isolated surface in a small New England town, and generously sent it out into the universe. “Stephen Maine: Fire and Ice,” produced in cooperation with Brooklyn’s ODETTA Gallery. 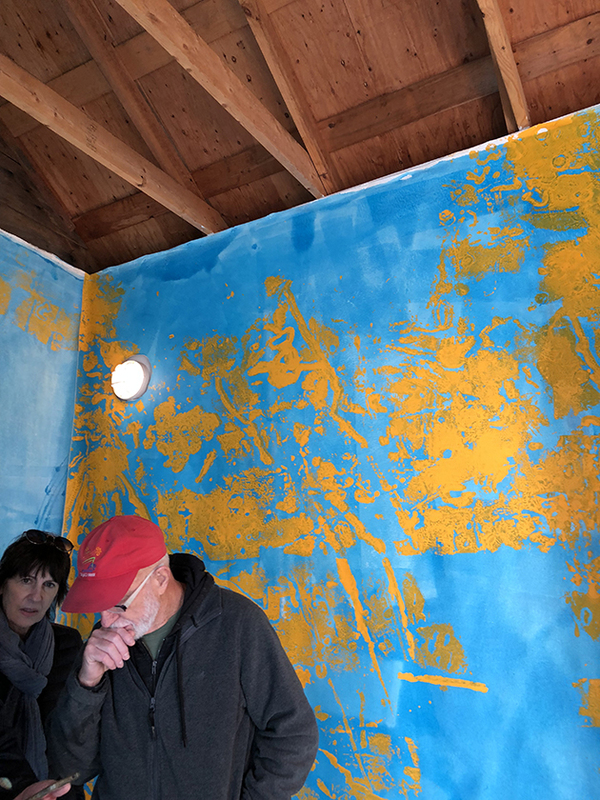 ICEHOUSE Project Space, Sharon, Connecticut. October 3 through November 6, 2018. Future projects at ICEHOUSE Project Space: In February Terri Moore will be rendering the inside of an iceberg crevasse, in the spring, look for a drawing installation and an exhibition by Marilla Palmer and Gelah Penn.